There are various flow meter types on the market, including paddle flow and mag flow meters, which are used to measure the flow of liquid or gas across many engineering industries. BM Engineering Supplies distributes a wide range of flow meters from Bürkert – one of the world’s leading manufacturers of measurement and control systems for liquids and gases. The Bürkert Type 8030 paddle wheel flowsensor is a popular choice, thanks to its compact fitting and easy connectivity. It is suitable for neutral, slightly aggressive liquids, and is often used to measure the flow of liquids within the food and drinks industry. A magnetic flow meter is recommended for use with wastewater applications or dirty liquids. These flow meter types do not have any moving parts, and instead use a magnetic sensor fitting to measure the flow of liquids. We supply a range of magnetic flow meters from Bürkert. If your business requires gas to be measured as it travels through a tube, a mass flow meter would be the best option. This gas flow meter uses an inline sensor based directly in the main channel, which delivers an extremely fast response time. A mass flow meter is less sensitive to contamination, too – which ensures a truly reliable process. For use with highly viscous liquids, such as glue, honey or oil, a positive displacement flow meter is recommended. This type of liquid flow meter is proven to work well in an environment where there may be multiple flow rates. The Bürkert Type 8071 is a good example of this. A digital water flow meter provides accurate and easy-to-read measurements. Digital water flow meters from Bürkert can be used in various industries to measure the flow of water and other clear fluids. We also supply digital flow meters for linear, nonlinear, mass or volumetric liquids and gases. Magnetic flow meters are a common flow meter which utilises electromagnetic induction. They work by applying a magnetic field to a metering tube which then results in a potential difference proportional to the flow velocity perpendicular to the flux lines. Mag flow meters are most commonly used in the wastewater industry. BM Engineering Supplies stock a range of Bürkert mag flow meters, suitable for use with liquids of a conductivity of 5uS/cm. Where are magnetic flow meters used? Magnetic flow meters can be used across an array of applications and industries. They are most commonly used in industrial wastewater treatment as they can be adapted for sanitary uses and can be used in dirty liquids and even slurries. Less commonly, magnetic flow meters are used in the chemical, food and beverage, oil and gas (although not for oil and gas fluids but in support of the processes), power, pulp and paper, metals and mining, and pharmaceutical industries. A mass flow meter is a device that measures the mass or volumetric flow rate of fluid moving through a tube. The mass flow rate is measured by the fluid travelling past a fixed point per unit time. 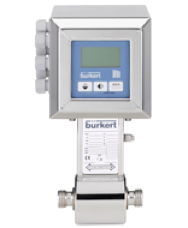 Bürkert are leading mass flow meter manufacturers and here at BM Engineering Supplies, we distribute a range of Bürkert flow measurement equipment, including mass flow meters. Where are mass flow meters used? Mass flow meters are used across a range of applications and industries. They are most effective in mass related processes as they measure the force that results from the acceleration of mass. Typical applications for mass flow meters are related to chemical and gas processes. However, other industries such as pharma, power, mining and wastewater also make use of mass flow measurement equipment. The digital mass flow meter type 8006 uses an inline sensor based on the thermal principle located directly in the main channel. This results in a very fast response time. Another benefit of this main stream measurement is that it is less sensitive to contamination. Paddle wheel flow meters are one of the most popular flow measurement devices, due to their cost efficiency and reliability. Used in a wide range of applications, paddle flow meters sense, measure and control the flow of liquids, usually water, in a range of applications. Certain paddle type flow meters can also be used with more aggressive liquids if necessary. BM Engineering Supplies distributes a range of paddle flow meters from leading manufacturers Bürkert, for a range of applications. Where are paddle flow meters used? A paddle wheel flow meter is most commonly used in water applications, due to the high accuracy at high flow rates. Where necessary, certain paddle flow meters can be used with more aggressive liquids. However, it is important to bear in mind that abrupt transitions between gas to liquid flow should be avoided. With a similar operating principle to the turbine meter, paddle type flow meters use the mechanical energy of a fluid to rotate the paddlewheel through the flow stream. The movement of the paddle is often detected magnetically, with each paddle or embedded piece of metal generating a pulse. The transmitter processes the pulse signal to determine the flow of the fluid. At BM Engineering, we stock a range of high performance Bürkert paddle type flow meters for use with clear, neutral or aggressive liquids. The Bürkert type 8030 paddle wheel flow meter offers continuous flow measurement, especially designed for neutral, slightly aggressive and solid free liquids. The type 8030 also features economic integration, without additional piping. The Bürkert type 8032 paddle type flow meter can be used with clear, neutral or aggressive liquids, to establish a monitoring system or an on/off control loop. A positive displacement flow meter is one of the most effective flow measuring technologies available on the market. The positive displacement meter directly measures the volume of fluid that passes through the flow meter, providing extremely accurate results. BM Engineering Supplies, offers a range of Bürkert positive displacement flow meters, suitable for use with viscous fluid. A positive displacement meter otherwise known as PD flow meter measures the volumetric flow rate of a fluid or gas, by trapping pockets of fluid between rotating components, within a high division chamber. The PD flow meter then uses pressure and temperature compensation to accurately determine the mass flow rate. Their working principle allows pd flow meters to offer extremely high accuracy, which is perfect for any industrial application. Bürkert Type 8071, used for measurement or batch control of highly viscous fluids. The type 8071 has exceptional repeatability and high accuracy across a wide range of viscosities and flowrates. This specific flow meter uses the oval rotor principle, which is a reliable, highly accurate volumetric method of measuring flow. Bürkert Type 8072 is more compatible with slightly viscous fluid, to establish a monitoring system or an on/off control loop. The positive displacement meter can be used under the 3-key keypad or using an external source. What type of flow meters do BME offer? Do you supply Bürkert flow meters? Yes. Here at BM Engineering, we supply a range of Bürkert flow meters, including the Burkert Type 8071 positive displacement flow meter. The Type 8071 is used for measurement or batch control of highly viscous fluids. It has exceptional repeatability and high accuracy across a wide range of viscosities and flowrates.